In January 2009, new blue uniforms were issued to Transportation Security Administration officers at hundreds of airports nationwide. The new uniforms – besides giving officers a snazzy new look – also gave them skin rashes, bloody noses, lightheadedness, red eyes, and swollen and cracked lips, according to the American Federation of Government Employees, the union representing the officers. “We’re hearing from hundreds of TSOs that this is an issue,” said Emily Ryan, a spokeswoman for the union. The American Federation of Government Employees blames formaldehyde. In 2008, an Ohio woman filed suit against Victoria’s Secret, alleging she became “utterly sick” after wearing her new bra. In her lawsuit, the plaintiff said the rash she suffered was “red hot to the touch, burning and itching.” As more people came forth (600 to be exact) claiming horrific skin reactions (and permanent scarring to some) as a result of wearing Victoria Secret’s bras, lawsuits were filed in Florida and New York – after the lawyers found formaldehyde in the bras. 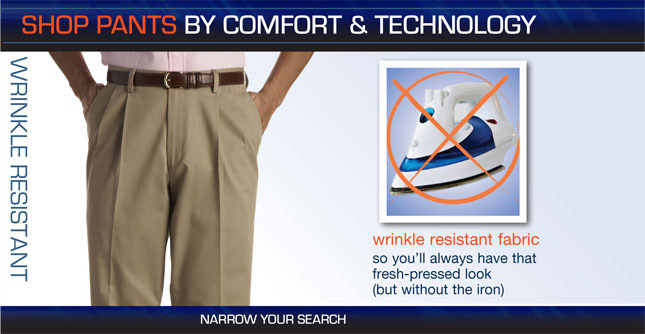 That’s why you can find retailers like Nordstrom selling “wrinkle-free finish” dress shirts and L.L. Bean selling chinos that are “great right out of the dryer.” And we’ve been snapping them up, because who doesn’t want to ditch the ironing? Formaldehyde is another one of those chemicals that just isn’t good for humans. Long known as the Embalmer’s Friend for its uses in funeral homes and high school biology labs, formaldehyde effects depend upon the intensity and length of the exposure and the sensitivity of the individual to the chemical. The most common means of exposure is by breathing air containing off-gassed formaldehyde fumes, but it is also easily absorbed through the skin. Increases in temperature (hot days, ironing coated textiles) and increased humidity both increase the release of formaldehyde from coated textiles. Medical studies have linked formaldehyde exposure with nasal cancer, nasopharyngeal cancer and leukemia. The International Agency for Research on Cancer (IARC) classified formaldehyde as a human carcinogen. Studies by the U.S. Environmental Protection Agency (EPA) and the National Cancer Institute (NCI) have found formaldehyde to be a probable human carcinogen and workers with high or prolonged exposure to formaldehyde to be at an increased risk for leukemia (particularly myeloid leukemia) and brain cancer. Read the National Cancer Institute’s factsheet here. Formaldehyde is one of about two dozen chemical toxins commonly found in homes and wardrobes that are believed by doctors to contribute to Multiple Chemical Sensitivities (MCS). Chemical sensitivities are becoming a growing health problem in the U.S. as the persistent exposure to harsh and toxic chemicals grows. One of the signs of increasing chemical sensitivities is the rise of contact dermatitis caused by formaldehyde resins and other chemicals used in textile finishes. Repeated exposure to even low levels of formaldehyde can create a condition called “sensitization” where the individual becomes very sensitive to the effects of formaldehyde and then even low levels of formaldehyde can cause an “allergic” reaction, such as those suffered by the TSA workers. Countries such as Austria, Finland, Germany, Norway, Netherlands and Japan have national legislation restricting the presence of formaldehyde in textile products. But in the United States, formaldehyde levels in fabric is not regulated. Nor does any government agency require manufacturers to disclose the use of the chemical on labels. Because it’s used on the fabric, it can show up on any product made from fabric, such as clothing. And it can show up in any room of the house – in the sheets and pillows on the bed. In drapery hanging in the living room. The upholstery on the sofa. Even in the baseball cap hanging by the door. So we can add formaldehyde to the list of chemicals which surround us, exposing us at perhaps very low levels for many years. What this low level exposure is doing to us has yet to be determined. “New TSA Unifroms Trigger a Rash of Complaints (Formaldehyde)”, The Washington Post, January 5, 2009, Steve Vogel. Thrasher JD etal., “Immune activation and autoantibodies in humans with long-term inhalation exposure to formaldehyde,” Archive Env. Health, 45: 217-223, 1990. (5) Rao S, Shenoy SD, Davis S, Nayak S., “Detection of formaldehyde in textiles by chromotropic acid method”. Indian J Dermatol Venereol Leprol 2004;70:342-4. But for some reason we are refusing to acknowledge formaldehyde in room air inside our homes that are young children breath 24 x 7. Over the past 4 decades formaldehyde in room air in our homes has increased from no detectable to 14 parts per billion (ppb) to 29 ppb to 77 ppb to 200 ppb and still increasing. During these same decades, we as a society have seen cancer and asthma in young children skyrocket. We know that formaldehyde causes both cancer and asthma. Then for the past two years, families that have had health issues that they associated with their homes all had elevated formaldehyde. When these families took steps to address and reduce the formaldehyde concentration in their home’s room air, they all reported significant improvement in health. Many of the children are off asthma meds for the first time in years. California Air Resource Board released the most extensive research on indoor air quality in home back on December 15, 2009. This research showed that 98% of the homes tested exceeded the State’s 8-hour exposure level. Even adults breathe their air in their home that long everyday as we continue to breathe while we sleep. Yet this research got zero media coverage. The Sierra Club lead the way with the FEMA trailers by developing a very simple method consumer friendly method to measure the formaldehyde in your own home. Simply expose a passive formaldehyde badge for 48 hours and mail it to the lab for analysis. Depending on the vendor selected this can be done for as little as $39. Then assuming your are in the 98% group that has a problem, passive color change tubes can be used to identify the sources of the formaldehyde gas. Source identification doesn’t need as much sensitivity so you can get 10 tests for $70. Testing on a warm sunny summer day and also on a cold winter day with the forced air furnace working hard are the best conditions to determine how bad your home is. It turns out that the air in our homes is far worse than in our work place because there are zero regulations for our homes. This helps explain why time after time the occupants that spend the most time at home tend to be the sickest. Thanks for all this information Rich. The U.S. Environmental Protection Agency has said that indoor air, which is often 100 times more polluted than outdoor air, is one of the top 5 health issues facing Americans. I purchased a 100% cotton white bathrobe online, and fabric at a retail shop — both in the last four weeks, and BOTH were DRENCHED in formaldehyde smell after I washed them in cold water and dried them. This explains it. I called federal consumer complaints : 1-800-638-2772 Ask for Joel he’s heard the details he will file a complaint report — at least that’s what he told me yesterday 11/14/2012. This is chemical corporations FORCING what they want: to sell more chemicals. A lady in the fabrics industry told me (can’t quote her) that the other issue is FILTHY container ships, and the chemicals are used to prevent lice, and other infestations of the fabrics on these ships. She’s heard that they lie and say it’s to ehance the life of the fabric. Anyone who knows information about the chemical / fabric industry “follow the money” trail please post it. I am so disgusted with having to do research constantly on a myriad of problems that never had to occur in the first place. One young man I heard recently said this: Business is the new war. 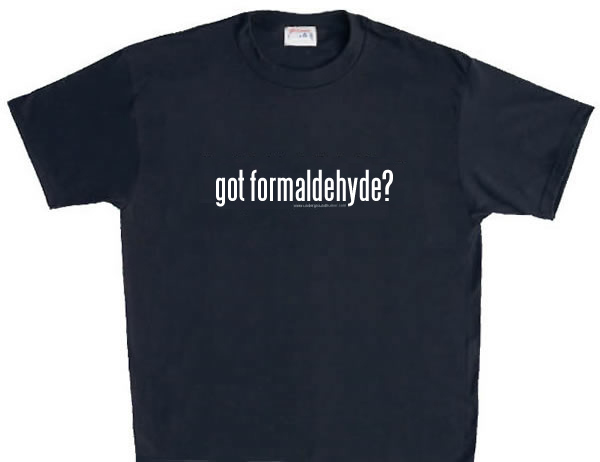 I don’t have any info… but I have a question re: formaldehyde in fabric. Currently being sold on TV are “potato pockets”…padded cloth bags. You can put 1-4 potatoes in the bag, then nuke them for varying times, depending in how many potatoes you nuke. Some ladies have come up with their own patterns to sew these pockets. Without some special kind of liner, are these safe to use? Hi Margarita: Without knowing what the bag is made of I can’t comment. Even if you buy a GOTS certified fabric and make your own, I don’t know what microwaves do to the fabric. You can nuke a potato in the microwave without a bag,so I guess I’m confused by the use of the bag. Does it do something special? I found your site by loging onto Enternet Explorer. I bought a new couch a few days and looked forward to lying on it while watching my favorite tv shows. Well, that happened and so did a severe asthma attack. That was not my first attact so I knew pretty much what to do. I was puzzled. Why an attact?? I did all of my treatments that help to avoid asthma attacts. Then it hit me. some one had once told me that they were allergic to fabrics on a chair that she had recently purchased. FORMALYHYDE~!!! I will spend the day learning more about the possibilities. Thanks to Eileen for the phone number for Consumer Complaints. understand J Rockafeller and Henry Waxman headed a committee concluded Formaldehyde in clothing was not a problem. Its interesting that the building industry has reduced the levels in many products but clothing industry can still be so obstainant. nice written and come wiith approximateky all significant infos. What are we supposed to do? I went to get dress shirts for work recently and they are all now “easy care”. There is no other option (in anything that fits me properly). I was wondering why my bed sheets were giving me that typical burning eyes sensation that I get around formaldehyde and pvc off-gassing, only to realise that most bed sheets are not easy care even if they don’t mention it. I had to hunt around just to find some that were not easy care even though there is no labelling (the dull, non-shiny ones seem to be free from this chemical). It certainly doesn’t go away from washing either. I must be one of the sensitive people, because I don’t know why anyone would stand for this kind of thing, let alone supposedly demand all of their textiles be easy care. Hi Andrew: We’re all actually pretty powerful as consumers. You ask what we can do: You can start by buying sheets that are GOTS certified – there are more and more of them on the market. Clothing is another matter, as the fashion industry is not in the forefront of adopting change. Look for Oeko Tex certified clothing (pretty hard to do as there are not many on the market) or buy from manufacturers that you trust (Nau perhaps, or Loomstate) though I don’t think either of them makes men’s dress shirts. I associate “easy care” with lower price points (probably a bias of mine), so perhaps very high end cotton or linen shirts might not have the “easy care” properties. Sorry to push you toward the higher end! Also join forces with others: get involved and change this situation. For example, you might push for reform of the antiquated Toxic Substances Control Act of 1976. I just bought some fabric to use in a baby quilt and after the lady cut what I needed she mentioned that it was “wrinkle free” and I thought, “well, it’s 100% cotton so it should be fine. Then, I got to wondering if I should wash it first before mixing it in with my other fabrics, but after reading your articles I don’t think I want to use it at all! Thank you!